Lizzo has released Tempo featuring Missy Elliott. The track is the latest to be lifted from her new album, 'Cuz I Love You', which drops on April 19. It's an amazing amalgamation of both artist's style, Lizzo's unflinching confidence with Elliott's alternative approach to rap, against an eclectic backdrop of varying beats and samples, with a flute flourish thrown in for good measure. Lizzo kicks off her Cuz I Love You Tour on April 22 in San Francisco, following her sets at Coachella. She has also lined up a brace of UK shows in May, calling in Manchester on May 26 and London the following day. Click here to compare & buy Lizzo Tickets at Stereoboard.com. 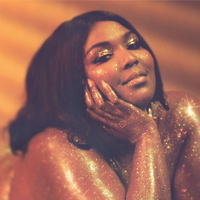 Lizzo has shared the title track of her new album. Lizzo has scheduled two headline shows towards the end of May.